The 2018 Trout Run Trail Tour Day, sponsored by the Decorah Rotary Club (DRC), was hosted this year on Tuesday, August 21. This is an annual event allowing an opportunity for the elderly and those with physical limitations preventing routine access to the Trail to experience the beauty of the entire 12-mile circuit. As with past years, the local community came out in large numbers and filled every available seat on each of the multiple loops of the trail. The luncheon hosted at the Chuck Gipp Decorah Fish Hatchery was enjoyed by all. Our Club extends its thanks to the following DRC members and friends for their volunteer service: Andy Nimrod (signage); Jim Morrow and Jerry Aulwes (registration); John Baker, Phil Iversen, and Elliot Christen (set-up); Cal Anderson, Jon Christy, Robert Dahl, and Dacia Monson (meal service); Maury Lenz, Jim Dale, and Ron Taylor (take-down); Mike Huinker, Paul Scott, Darryl Branhagen, Don Arendt, Collyn Bridges, Dallas Steffen, Harlan Satrom, Bill Brennig, John Kerndt, and Les Askelson (vehicle operation). 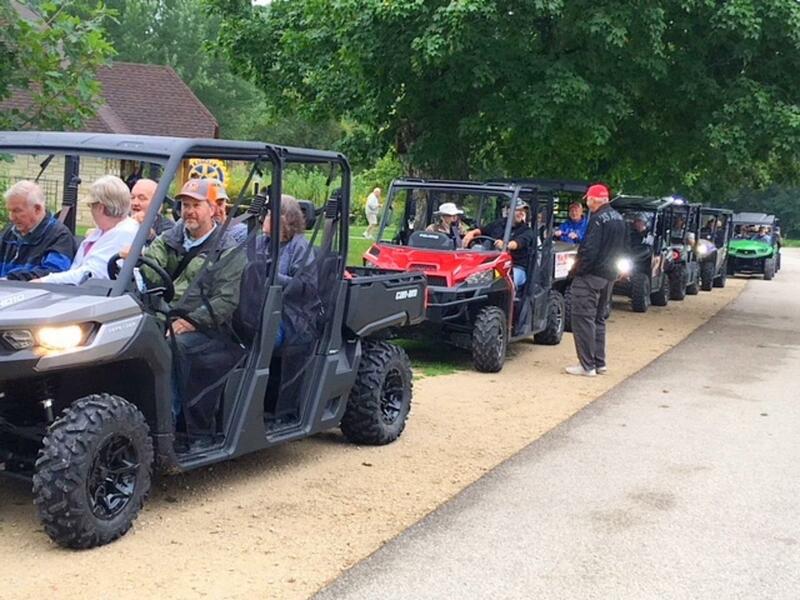 A special thanks to the following implement dealers and individuals who donated the use of their off-road vehicles: Bodensteiner Implement Company - Decorah, Decorah Kawasaki Sports Center, M&M Lawn and Leisure - Rushford, Les Askelson, John Kerndt, Adam Thornton of Thornton’s Feed and Grain in Decorah, and Jeremy Bjerke. Thanks also to the Chuck Gipp Decorah Fish Hatchery, the City of Decorah, the 28-E Committee, Quillins, Java Johns, and Decorah Rental for working with our Club to facilitate this event. Sincere thanks to DRC members Francis and Marilyn Peterson, Mike Huinker, and Harlan Satrom for helping coordinate the event. Last but certainly not least, we extend our heartfelt appreciation to DRC member Jennifer Gipp for her leadership and vision in establishing this event as an annual DRC tradition and maintaining its continued success and popularity. Finally, DRC would also like to recognize and thank all of the land donors who made the Trout Run Trail possible and such a special addition to the Decorah community.